Coming into first year, I did not know exactly what I wanted to study. The course flexibility offered in the faculty of Arts and Humanities allowed and encouraged taking courses in multiple subject areas. 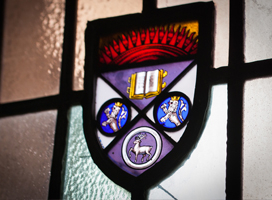 The ability to explore various areas of interests drew me to the faculty. Not only was I able to narrow down my focus, I discovered a passion for new subjects which I carried throughout my undergraduate degree. 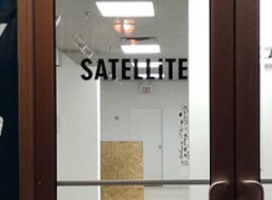 One highlight for me was doing a year-long internship with Satellite Project Space in downtown London. This internship was a chance for me to apply the skills I had learned in the classroom to a real-world gallery. I was able to work with arts institutions across the city and regularly met with students, artists, professors, and gallery staff. The internship was the perfect opportunity for me to use both my business and art background to make an impact on the gallery. Under the supervision of an amazing mentor, I gained invaluable experience crafting independent projects, working with arts institutions, implementing marketing initiatives, and drafting a business plan. The internship was an enjoyable experience that taught me a lot, grew my network, and expanded my resume. It is definitely a highlight of my undergraduate experience so far. I am in the process of applying to graduate programs with a goal of working in a museum or gallery in the near future. Get involved and get out of your comfort zone. 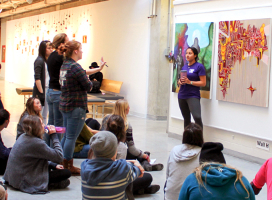 There are so many opportunities to get involved on campus, both within and outside of the arts. 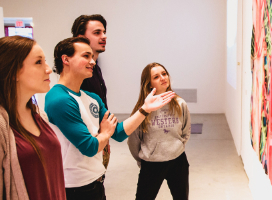 Explore the opportunities Western offers and you will graduate with relevant experience and lifelong friends. Take courses outside of your immediate program, take time to interact with your professors, and learn from your peers. Arts and Humanities is such a welcoming faculty, you only need to put yourself out there and you will be amazed by what you discover. The faculty in Arts and Humanities are incredible. Throughout my five years, I have consistently met professors who go above and beyond what is expected. Many of them make a particular effort to know your name, your story and will go out of their way to help you with things outside of the scope of their class. Professors have introduced me to opportunities I would have never found on my own. One professor from my first year still emails the class about opportunities to take advantage of on and off campus. Their concern for your professional development is incredible, and I can't imagine my experience at university without these role models.